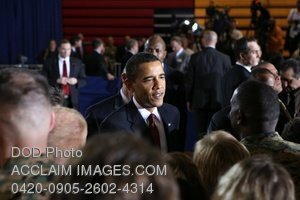 Description: Stock photo of President Barack Obama meeting with U.S. service members and civilians during a visit to Camp Lejeune, N.C., Feb. 27, 2009. Obama is visiting Camp Lejeune to speak on current policies and exit strategies from Iraq. (DoD photo by Lance Cpl. Aaron Dubois, U.S. Marine Corps). Stock photography by Department of Defense Public Domain.